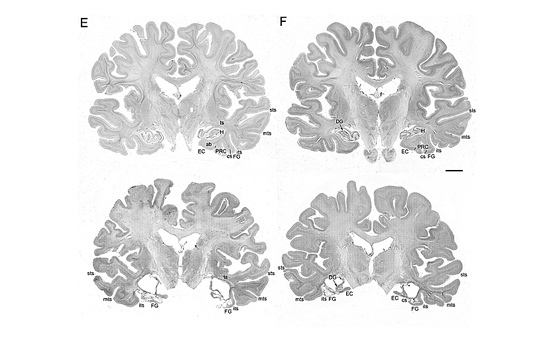 These photomicrographs depict comparative stained sections of a healthy brain (top) and of patient EP, in which significant structures in the medial temporal lobe are heavily damaged or missing. The letters identify specific brain structures, such as EC and PRC for entorhinal cortex and perirhinal cortex, respectively, both important to memory formation and function. An international team of neuroscientists has described for the first time in exhaustive detail the underlying neurobiology of an amnesiac who suffered from profound memory loss after damage to key portions of his brain. Writing in this week’s Online Early Edition of PNAS, principal investigator Larry R. Squire, PhD, professor in the departments of Neurosciences, Psychiatry and Psychology at the University of California, San Diego School of Medicine and Veteran Affairs San Diego Healthcare System (VASDHS) – with colleagues at UC Davis and the University of Castilla-La Mancha in Spain – recount the case of EP, a man who suffered radical memory loss and dysfunction following a bout of viral encephalitis. EP’s story is strikingly similar to the more famous case of HM, who also suffered permanent, dramatic memory loss after small portions of his medial temporal lobes were removed by doctors in 1953 to relieve severe epileptic seizures. The surgery was successful, but left HM unable to form new memories or recall people, places or events post-operation. HM (later identified as Henry Gustav Molaison) was the subject of intense scientific scrutiny and study for the remainder of his life. When he died in 2008 at the age of 82, he was popularized as “the world’s most famous amnesiac.” His brain was removed and digitally preserved at The Brain Observatory, a UC San Diego-based lab headed by Jacopo Annese, PhD, an assistant adjunct professor in the Department of Radiology and a co-author of the PNAS paper. Like Molaison, EP was also something of a scientific celebrity, albeit purposefully anonymous. In 1992, at the age of 70, he was diagnosed with viral encephalitis. He recovered, but the illness resulted in devastating neurological loss, both physiologically and psychologically. Not only did he also lose the ability to form new memories, EP suffered a modest impairment in his semantic knowledge – the knowledge of things like words and the names of objects. Between 1994, when he moved to San Diego County, and his death 14 years later, EP was a subject of continued study, which included hundreds of different assessments of cognitive function. “The work was long-term,” said Squire, a Career Research Scientist at the VASDHS. “We probably visited his house 200 times. We knew his family.” In a 2000 paper, Squire and colleagues described EP as a 6-foot-2, 192-pound affable fellow with a fascination for the computers used in his testing. He was always agreeable and pleasant. “He had a sense of humor,” said Squire. After his death, EP’s brain was also processed at The Brain Observatory. The last five years have been spent parsing the data and painting a full picture of what happened to EP and why. Squire said EP’s viral encephalitis infection wreaked havoc upon his brain: Large, bilateral, symmetrical lesions were found in the medial temporal lobe, portions of the brain responsible for formation of long-term memory; and whole, crucial structures were eliminated – the amygdala and hippocampus among them. 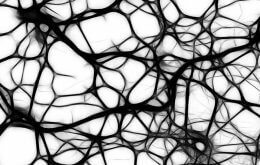 Additionally, other brain regions had atrophied and white matter – the support fibers that transmit signals between brain structures – had become gliotic or scarred. Though HM is generally considered the “gold standard” of amnesia patients – “he was the first case and studied so elegantly,” said Squire – EP provides new and surprising twists in understanding how memory functions and fails. Squire noted that the massive scope of EP’s brain damage also appeared to trigger secondary consequences. “If a lesion gets large enough, it results in other negative changes due to the loss of connectivity,” he said. In EP’s case, one result was his impaired semantic knowledge, which wouldn’t have been harmed by damage to medial temporal lobes, but was the consequence of subsequent atrophy in adjacent tissues. Finally, EP presents a continuing, confounding mystery. In most patients with retrograde amnesia, memory loss is limited. They can’t remember things within a few months or years of the brain impairment. In EP’s case, he suffered amnesia extending back 40 to 50 years, affecting memories that theoretically should have been well-established and consolidated, though he could recall his childhood on a central California farm. Squire said the effect is likely the result of lateral temporal damage caused as a secondary consequence of the initial disease-related brain damage. For researchers and clinicians, he said, EP is a cautionary and troubling tale. Co-authors are Ricardo Insausti, Department of Psychiatry and Behavioral Sciences and the Medical Investigation of Neurodevelopmental Disorders (MIND) Institute, UC Davis and Laboratory of Human Neuroanatomy, Department of Health Services and Regional Center for Biomedical Research, School of Medicine, University of Castilla-La Mancha, Spain and David G. Amaral, Department of Psychiatry and Behavioral Sciences and the Medical Investigation of Neurodevelopmental Disorders (MIND) Institute. Funding for this research came, in part, from the Medical Research Service, Department of Veterans Affairs, National Institute of Mental Health (grants 24600 and 84756), NEI grant 18359, National Institute of Neurological Disorders and Stroke grant 16980 and grants TSI-020110-2009-362, BFU 2009-0434 and PR 2010-0434.